Here we are - it's a new year! Here's to a better 2018. It's been a bit quiet since Thanksgiving because life and illness got in the way. 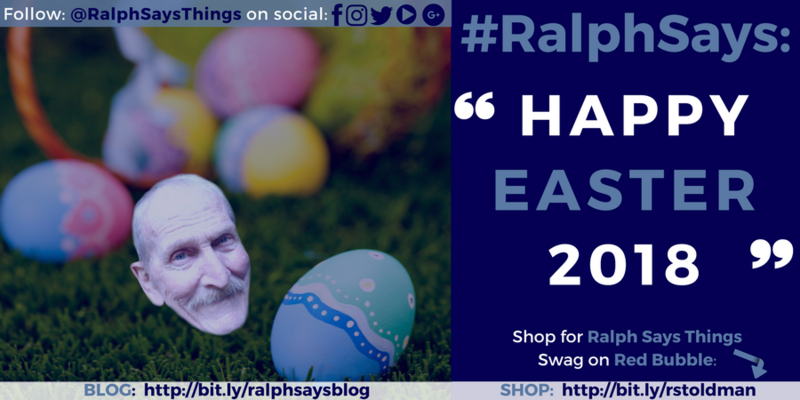 Been somewhat quiet on the Ralph Says Things Instagram and Twitter...but now that the New Year is under way, it's time to get back into the swing of things on Ralph's blog. 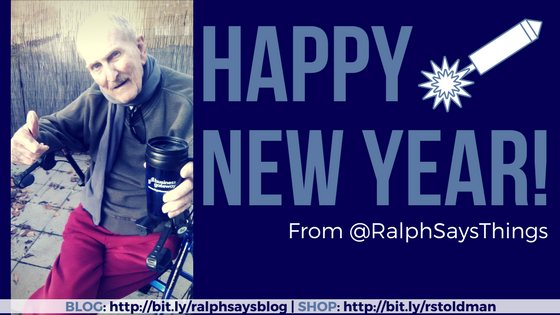 By the beginning of December Ralph was officially moved into his new home at Pleasure Point in Santa Cruz. Here's a little example of one of the scoundrels. We reckon the most ballsy one is Bruiser. He really is a bossy boots. Well we assume it's a "he" it can be hard to tell by the untrained eye. The neighbours keep ole Ralph on his toes and keep him company at the same time. We're looking to get a feeder for them and some appropriate food. He loves these guys and talks to them and about them daily. 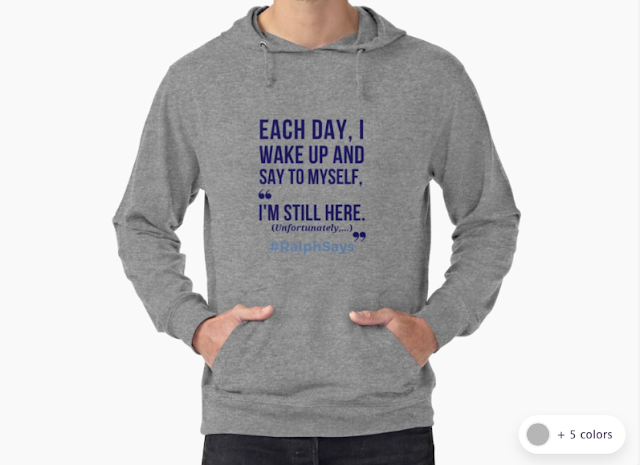 We're continually adding some new artwork to the Ralph Says Things Red Bubble store. We are open to ideas for designs too - if you want to suggest one or even make one. 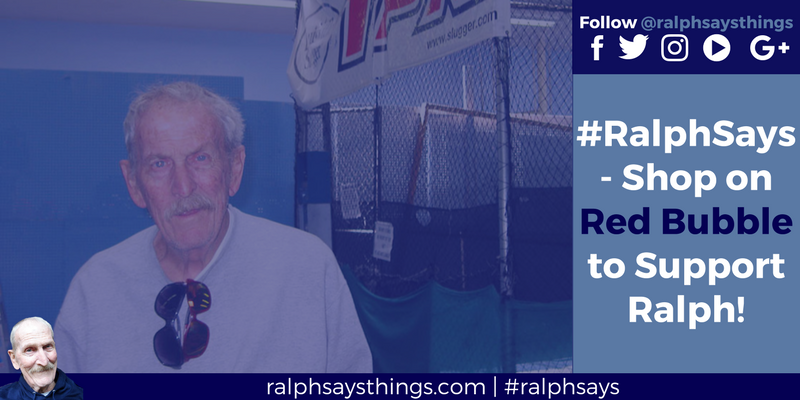 The idea behind Ralph Says Things is to not only make him a little bit of money but to have something to focus on. To say he's a bit bored with life would be an understatement. So this little project is an attempt to give him something to think about. This and the squirrels that is. 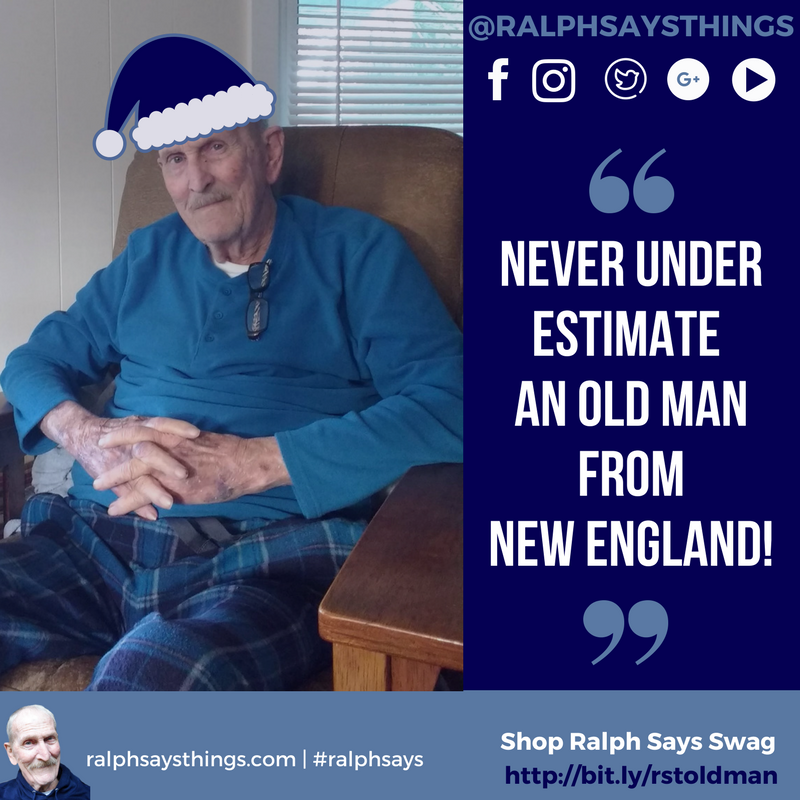 There is the Never Under Estimate an Old Man From New England design. There is also the newly uploaded Auld Yin design - which is available on a wide array of products! Auld Yin is Scots for Old Person. Old Man. Old Woman. Old Parent. It can also mean the Devil but usually in a more playful sort of way I believe. The only way I'd mean it if if I called my dad that, that's for sure! The one I will be getting next is the old man's face. 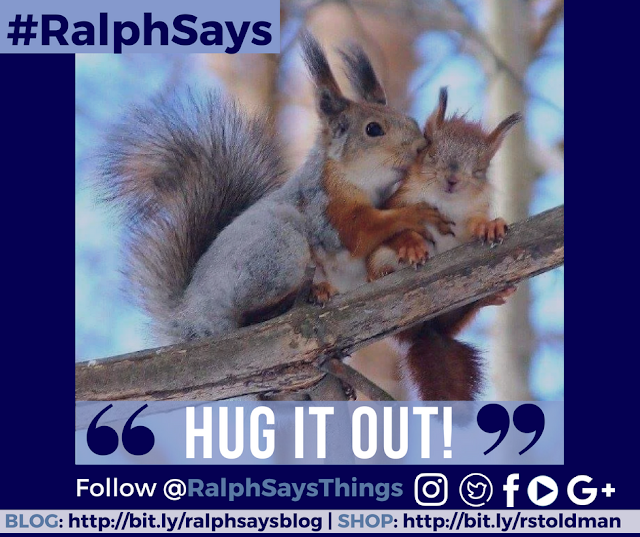 Ralph Says Things - Oh that Face! 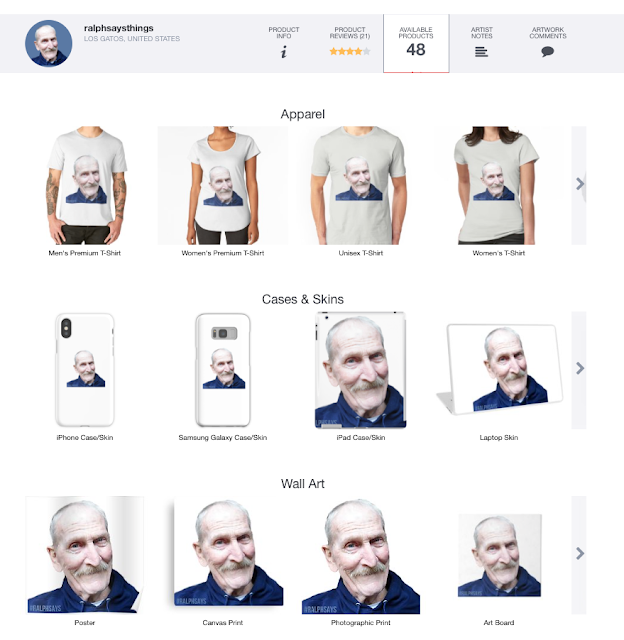 As you can see, it too is on a wide array of products on his shop. That makes it hard to design which to go for! If you haven't already then please follow Ralph Says Things on Social Media - Instagram, Facebook, Twitter and Youtube. Though he doesn't really understand it all, he does rather get a kick out of hearing from his followers! So do reach out and don't be shy. 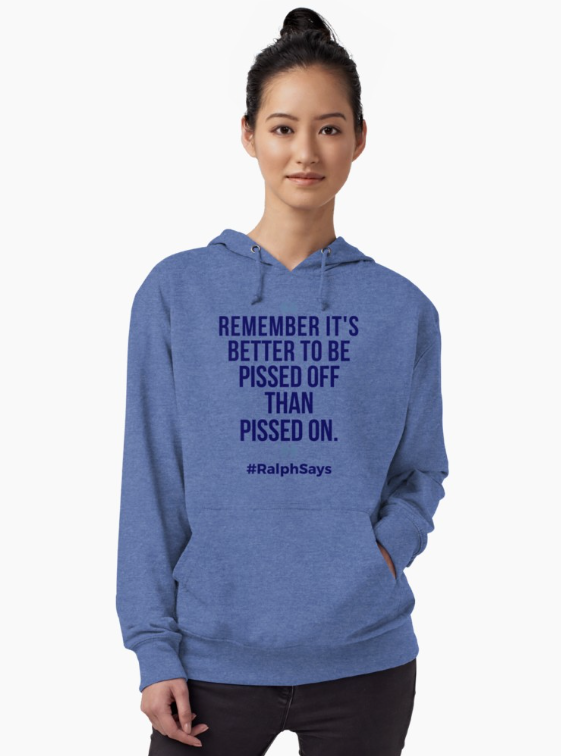 Ralph will delighting his followers with his quirky words of wisdom in 2018. Hello friends, family, followers and whoever else there is out there that's reading this. There's been a lot happening here in California - since being reunited. It's been a time of boxing, dumping, donating, sifting and sorting. It's been exhausting and stressful. Ralph is feeling terribly depressed about it all which is totally understandable. On today's broadcast I also asked for some help. 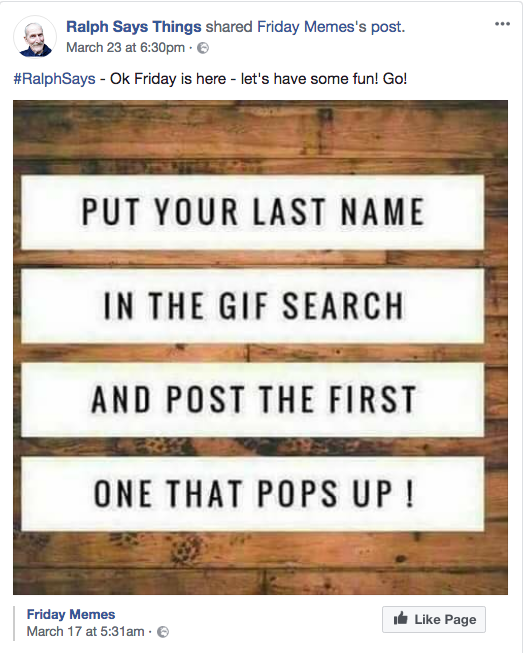 Ralph needs a new PC and iPad. So we either need someone to give him an old one, show us where we can get a cheaper one, or throw a buck or pound to the cause and we'll go get him one next week. It's a little depressing to see how little our attention spans are (people watching about 1:14 of a 15 minute video). So it's that time. 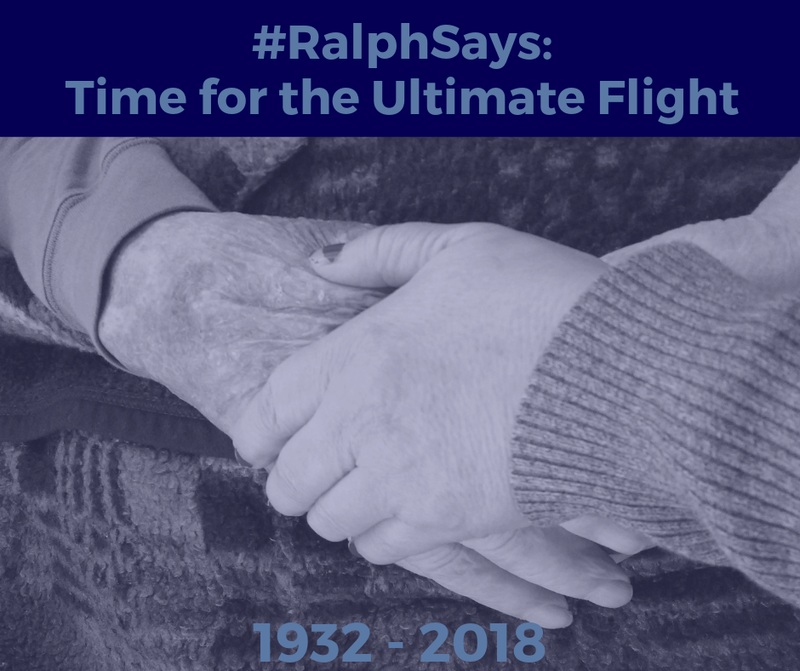 This week, Ralph will be giving notice on the home he's lived in for the last ten years, and moving into something altogether much more small. Truth be told it's a little heartbreaking for me...Most people, it seems, go up in the world. When they move it's usually to bigger places, but ever since the '80s, each time Ralph has moved, it's to a place that is smaller one than the one before. For a man who's worked hard his whole life, that is the part that I am having trouble with. More trouble than I think he is about it. These days, he spends much of his time streaming TV show in a binge-like-fashion. So it doesn't matter where he calls "home". This time next month he'll be in his new abode. It's not going to be the easiest of months, but once he's in, he's in. To turn to slightly more cheery subjects - Ralph's walking. 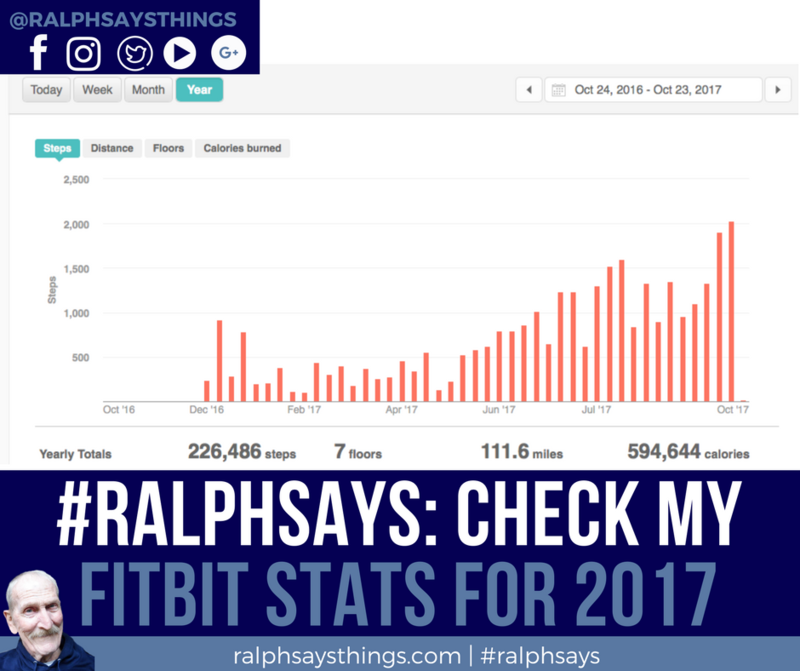 Bought him a Fitbit for Christmas and he didn't much give a crap, to be honest. It's often the case when buying something for Ralph. He gets presents and he's not too fussed. You should have seen how nonchalant he was when got his iPad. It was the textbook definition of apathy or ambivalence - until a week later when it was his new best friend. Well the Fitbit took slightly longer for him to come around to, but he finally has. I'd set his daily steps for 2000 at a time he was probably doing 400 (Bed - Bathroom - Kitchen - Repeat). During my last visit however, we put the Fitbit in his sock and now, low and behold, he's a changed man. He checks his stats daily and tells me to. He's doing those 2000 steps pretty regularly. 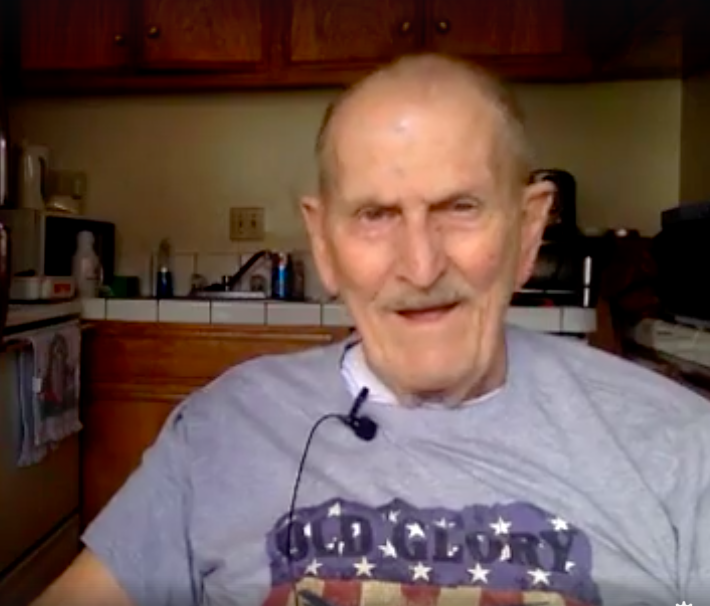 Not bad for an ole fella. 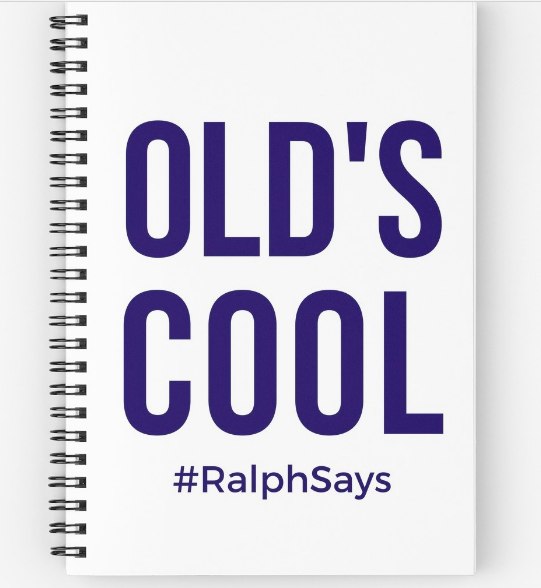 This week a teacher friend called Jane bought a couple of the Ralph Says "Old's Cool" spiral notebooks off of Ralph Says Things on Red Bubble. Her notebooks are in "charcoal" - not navy - as pictured above. This is what I got. I can't wait to see it - in a week or two. 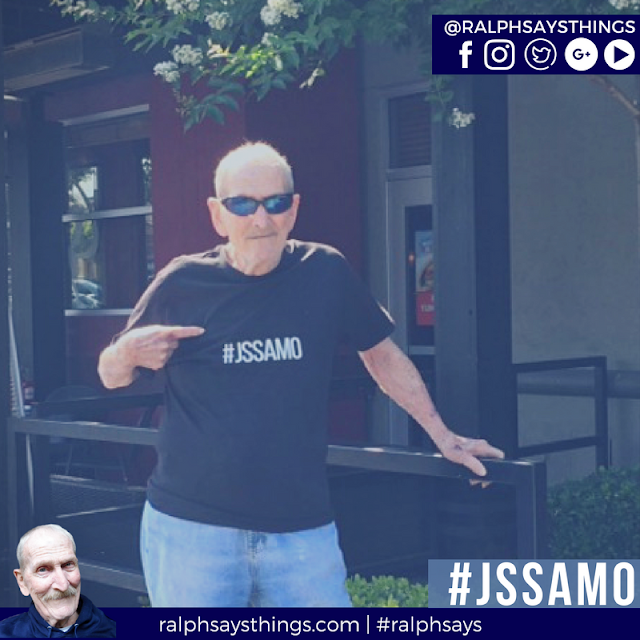 On the last Ralph Says post it was Joan from JL Formulations who shared pictures of her cool Ralph Says Swag. 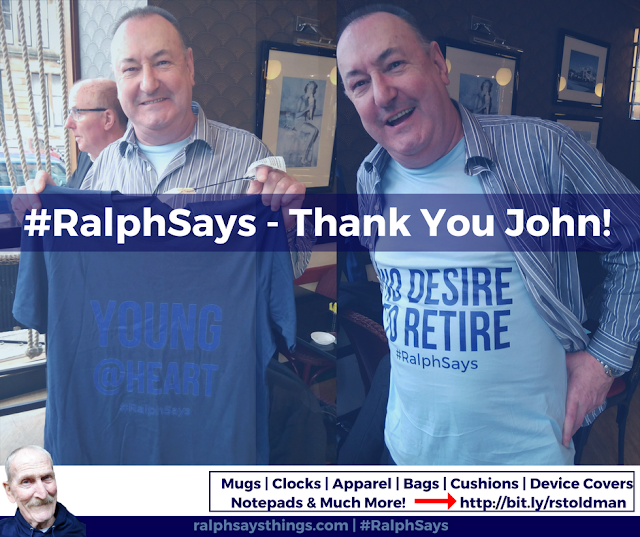 This week it's a big Ralph Says "thank you" to John for showing off his two, new Ralph Says shirts! John kindly picked up No Desire to Retire and Young @ Heart last month. We reckon he wears it well, don't you think? Thanks so much JC. You're a pal! We appreciate the support people! If you've bought any Ralph Says Swag on Red Bubble, then please share it with us...Remember it's not just apparel, it's stationery, bags, device covers, home decor and much more! It's also where we'll be doing FB lives soon. 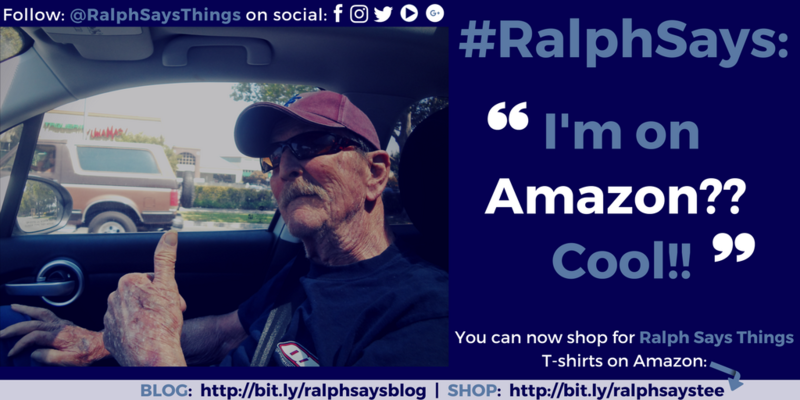 #RalphSays - Shop on Red Bubble to Support Ralph! 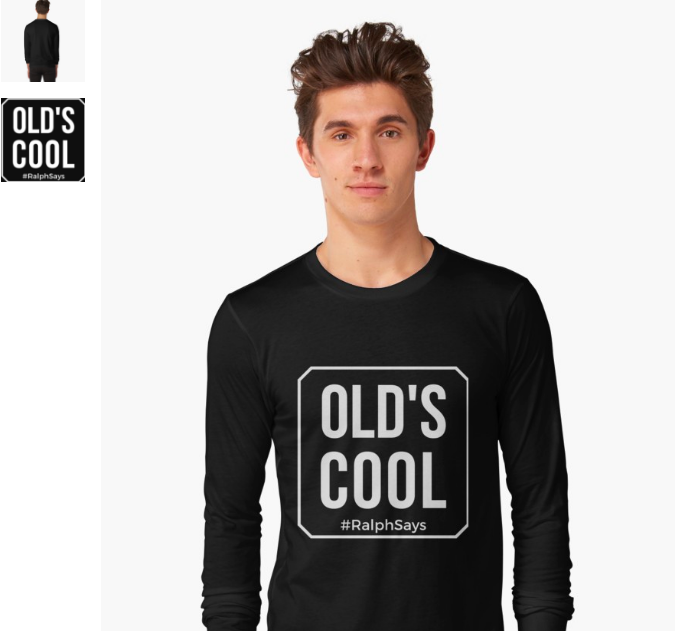 So #RalphSays - Shop on Red Bubble to Support Ralph....Ralph's got all kinds of original "Swag" on his Red Bubble store. The "swag" includes things like T-shirts, Hoodies, Clocks, Stationery, Stickers, Mugs, Cushions, Clocks, Wall Art and so much more. Why? To help Ralph that's why. Consider it a bit of charity for someone who's probably worse off than you. Well, he'll be giving notice on his current residence soon, and moving to Santa Cruz to be nearer daughter number 2. He'll need to pay rent on both places for November...which is worrying. To be honest, he's taking it mostly in stride, but it must be incredibly stressful and depressing to even consider...not only the move but the lack of money. 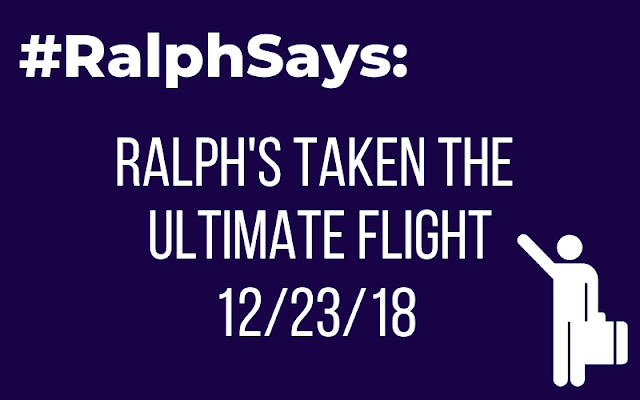 Why even launch #RalphSays? I've mentioned it before, but you may not have seen it here...It's not just to get him some much-needed cash, but to give him something to focus on. So it was my intention to create a little brand around him to give him some purpose. Sitting around hoping to win the lottery isn't the best strategy to run out one's days. The odds of winning, in whatever country we're in, are slim to nil. Of course people do win - in most draws but the odds are stacked against us. We'd love to work with anyone who wants to create some unique t-shirts for Ralph Says Things. We'd be happy to split any royalties made. We just need some designs beyond my simple efforts. I'm not a designer but I am doing what I said above, taking action. 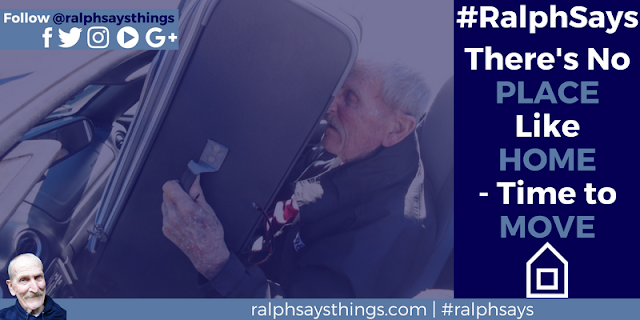 Time to crack on with real work...Thank you all for your support of Ralph. We appreciate it so much. You don't have to buy anything, even liking, commenting, sharing posts/tweets etc will help. Or sharing any content of old people with us by tagging us in what you come across. NOTE: I've decided not to link to Cafe Press anymore and focus on Red Bubble. 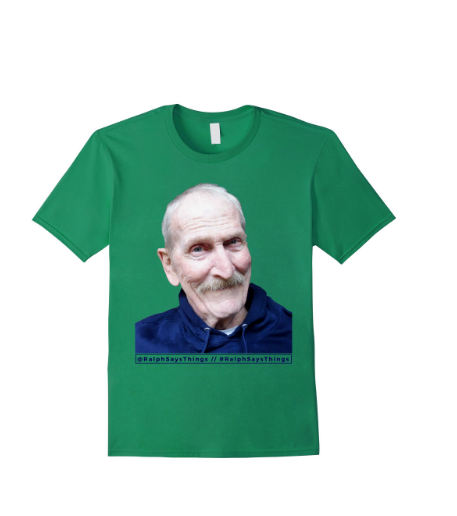 Have any t-shirt ideas, or want to do a joint venture design, then please let me know by commenting here.